Opened in 1949. Newly renovated in 2018. 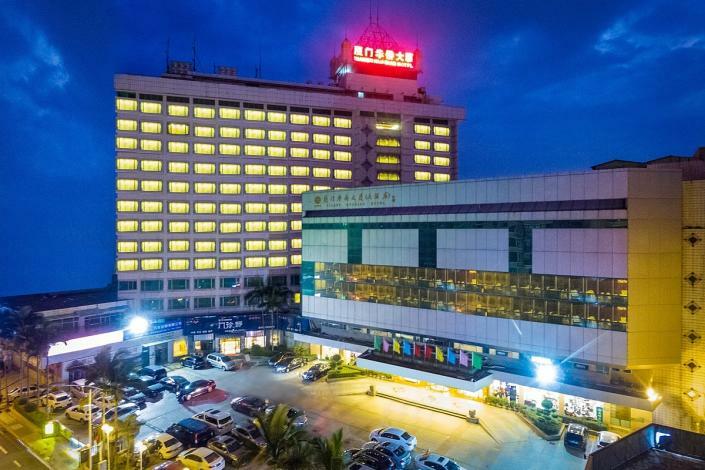 Xiamen Huaqiao Hotel can provide various,deluxe services in the aspect of accommodation, food and beverage, shopping, sightseeing and commercial affairs.It is just the right place for you to enjoy the service of enthusiasm, carefulness,cordiality and satisfactoriness. Guest first and service first is always our guideline.We sincerely welcome you to our Huaqiao Hotel! The Xiamen Huaqiao Hotel (Huaqiao Dasha) is located in downtown Xiamen, close to the busy shopping district of Zhongshan Road. It is 20 minutes' drive from the airport and 5 km (3 mi) from the railway station. The ferry to Gulangyu Island is just a few minutes walk away. The hotel's 248 guestrooms and suites are clean and comfortable, and guests can enjoy a range of local Fujianese dishes, Cantonese and Chinese favorites in the hotel restaurant. A good option for business travel to Xiamen, this hotel also boasts several meeting rooms and a business center. A pool table, swimming pool, gymnasium, sauna, beauty salon and ticket booking services are also available.